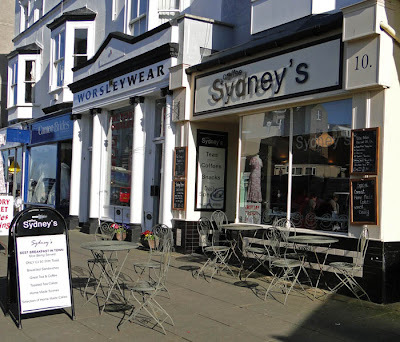 I'm always pleased to discover somewhere new to go for a good coffee and decided to pop into Coffee @ Sydneys at 10 Clonmel Street, Llandudno the other day to see what they were like. I had expected it to be a tiny coffee shop but was surprised to see that there were additional seating areas in both the rear of the cafe and on the First Floor (and of course, some outdoor tables for those warmer days). Decoration was also interesting, with a variety of hand painted 'words of wisdom' adorning the walls. Service was fast and pleasant, coffee was good and the prices were reasonable. Do pop in and give it a try if you're nearby. In case you've forgotten, Clonmel Street is the one linking Mostyn Street with the Promenade, having Greenwoods and Gregorys Jewellers on the Mostyn Street corners. Have you tried "The best breakfast in town?" Where's that, Reggie? Not the old Sarah J's (now Mollys) by the station? Ha, ha, no.....it's advertised on the board outside Sydney's - "Best breakfast in town, now being served". Yep i had a sandwich and soup there the other day Delicious! !